Sake is often the spirit that comes to mind when we think of Japan, but this country has developed an impressive range of spirits and liqueurs over centuries which are totally unique to the nation. On your holiday to Japan, it is well worth seeking out some of its most popular drinks to pair with your food, be it a sour umeshu cocktail or a glass of smooth Japanese whisky. 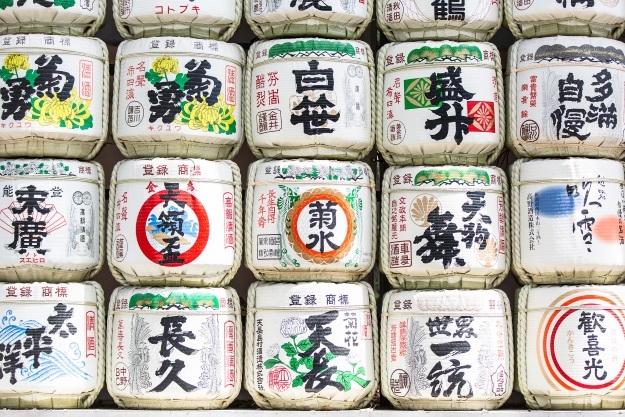 In this article, we introduce you to some of the most popular spirits of Japan. In 1923, Shinjiro Torii started building the first ever whisky distillery in Japan on the outskirts of Kyoto. Shinjiro, with the help of chemist Masataka Taketsuru, who studied the art of distilling in Scotland, decided that the town of Yamasaki (which now forms the city of Shiso) would be the perfect place to begin distilling his own whisky. By 1929, Japan’s first whisky was introduced under the name ‘Suntory’. Shinjiro marketed his whisky at a similar price to high quality Scottish whiskies, however it proved unsuccessful, and he continued his quest to create the perfect malt. After 10 years of attempts, Shinjiro had created an impressive, genuine Japanese whisky, with a rich flavour and fragrance. It was named ‘Kakubin’. Since the introduction of the Yamazaki Distillery’s first successful whisky, the company has developed beautifully distinguished single malts, such as the Yamazaki 12-year-old, Hibiki and Kakushu, which now form part of the Suntory brand. Its main competitor? Nikka, which was actually founded by Masataka Taketsuru when he left Yamazaki in 1934. Since Japan started its journey to whisky discovery, it has become a leading name in the industry. 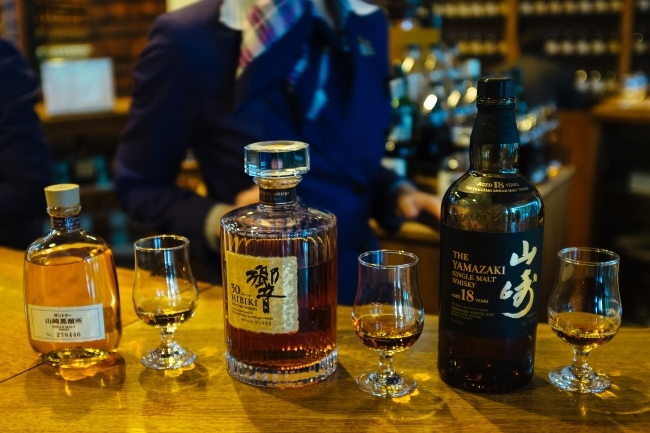 Japanese whiskies compete with and overtake some of the finest Scottish malts in international competitions, and are fast becoming a favourite among connoisseurs. “Japanese whisky has seen an incredible rise in popularity in recent years,” said Anne-Sophie, “but more than a simple fad, it’s a really interesting product and Japanese distilleries bring to the whisky world a whole new approach. The concept of harmony and balance is central in the Japanese culture and it shows in their whisky too! Sake is a Japanese rice wine, made by fermenting rice which has been polished to remove the bran. 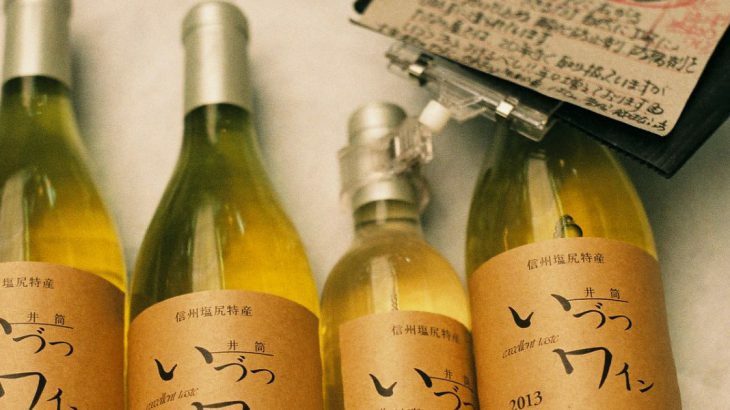 Despite being considered a wine, sake is produced in a process not dissimilar to beer, where the starch is converted into sugars which then ferment into alcohol. Although it is most commonly associated with Japan, sake actually originates in China. The earliest known production of the beverage took place in around 500 BC. Initially, sake was produced in a very rudimentary fashion, with people using the enzymes in their saliva to aid the fermentation process of the rice. However, once they discovered koji – a mould enzyme which could be used to ferment rice – the technique matured. It’s believed that this spread through Japan in the Nara period, resulting in the sake we know and love today. Temples in Japan became the primary distilleries of sake for centuries, and by the 1300s, sake had grown to become an important ceremonial drink. During the Meiji Restoration (1868 to 1912), new legislation allowed anyone with the resources and ability to brew sake, to open their own brewery. This saw some 30,000 sake breweries open within a year, however, increasing taxation on producers meant the majority were forced to close. Many surviving family-owned breweries are still open today. It’s estimated that less than 2,000 sake breweries remain in Japan, though the popularity of the country’s rice wine has dramatically increased worldwide. Breweries have since opened in the United States, South America and Australia. Throughout Japan, sake is often enjoyed with a light meal, as well as remaining an important part of ceremonies. While those outside Japan often think of sake as the most popular beverage, shochu is in fact the more prominent. It is a distilled liquor, unlike sake which is fermented. Shochu can be made from a variety of ingredients including sweet potato, barley and rice, and is typically stronger, on average 25-30%, and is sometimes likened to a ‘Japanese vodka’. 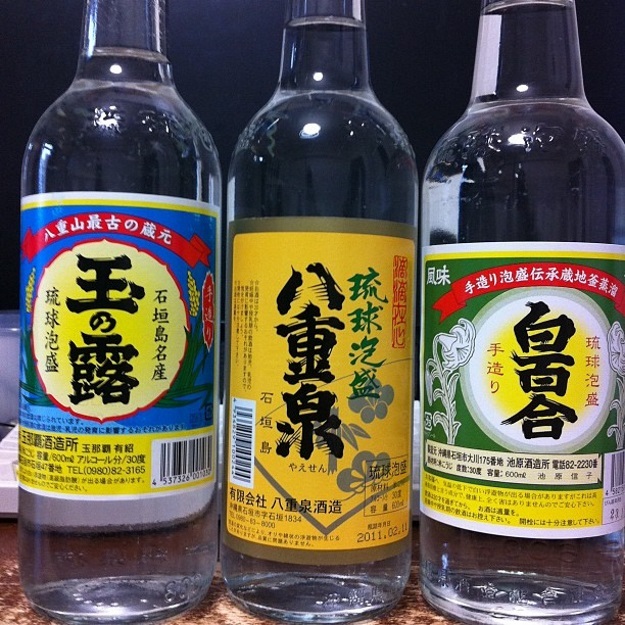 However connoisseurs argue that unlike a vodka, shochu retains the original aroma and flavour of its base ingredients. 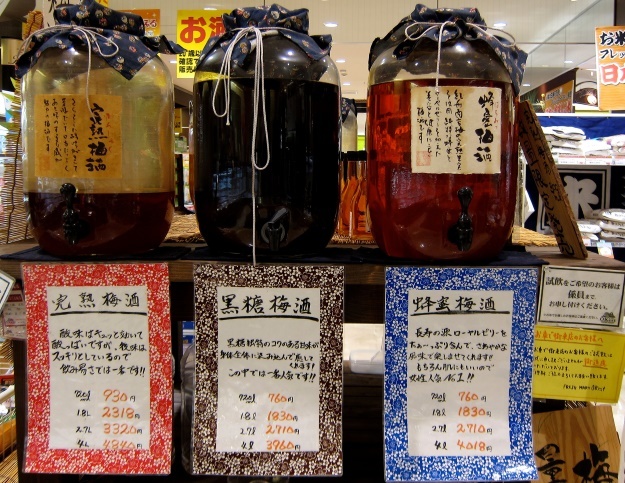 If you’re looking for shochu on your tour of Japan, the most common forms are imo-jochu (made from sweet potato), mugi-jochu (made from barley) and kome-jochu (made from rice). It is typically served mixed with cold or hot water. Umeshu is a sour Japanese liqueur made with native ume fruit. Otherwise known as a Japanese plum or Japanese apricot, ume grows on beautiful trees which blossom in the spring, much like cherry trees. The fruit is celebrated in festivals throughout the country. Unlike plums or apricots, ume is more sour, making it perfect for creating umeshu, one of Japan’s most popular drinks. The method requires the combination of the fruit, sugar and shochu, which is then left for around three to six months in a cold, dark place. It is then ready to drink. This unusual yet sweet liqueur typically has around 10-15% alcohol content and can be served on the rocks, or as an Umeshu Sour, Umeshu Tonic or Umeshu Soda. Alternatively many bars in Japan serve it in speciality cocktails. A Highball cocktail is a beverage made with alcohol and a mixer, in a large glass with ice. In this case, a Whisky Highball features whisky and sparkling water. Japanese whisky had its heyday from the 50s to the 80s. During this time, Shinjiro Torii, the founder of Suntory, introduced a chain called Torys bars, where the Kakubin Highball was a very popular drink. When enthusiasm for whisky died down in the 80s, it seemed as though the Highball might be lost forever. But in 2009, Suntory reintroduced the cocktail in can form, targeting a younger clientele. 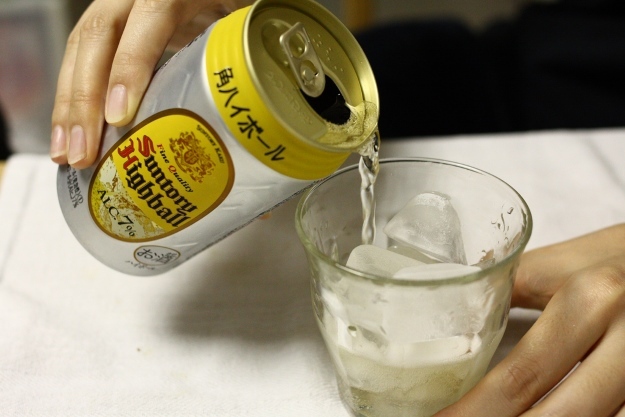 The Suntory Highball can now be found in supermarkets throughout Japan. Contrary to popular belief, beer is the alcoholic drink of choice for the Japanese, and most of it is made by the country’s four leading breweries: Asahi, Kirin, Sapporo and Suntory. 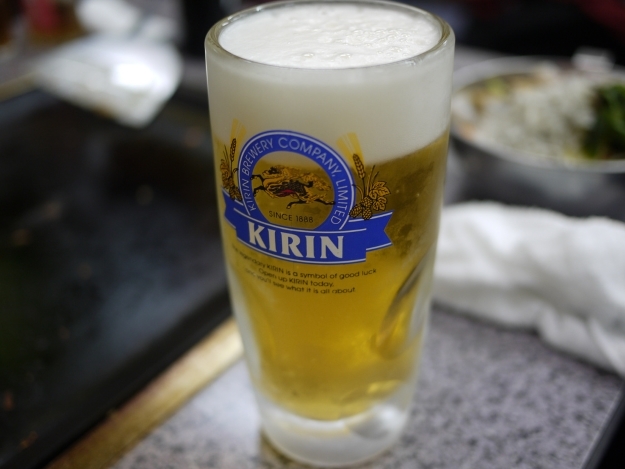 Pilsner-style beers, which are pale in colour and not too strong at 5%, are the most popular in Japan. It’s said that beer was initially introduced to Japan by Dutch merchants in the 17th century, with the first brewery, Spring Valley Brewery, opening in Yokohama in 1870. This later became the iconic Kirin Brewery Company. Today, beer or beer-like happoshu beverages (similar to beer but with lower levels of malt), are the most popular alcoholic drinks in Japan. Awamori is an alcoholic beverage unique to Okinawa. Made from long grain indica rice, and is distilled like shochu. Typically 30-40%, awamori is one of the stronger spirits available in Japan. It is aged in traditional clay pots to enhance its flavour, and is typically served with water and ice. If you’re apprehensive about trying this spirit neat, many bars and restaurants in the region also serve awamori in cocktails. On your tour of Japan, you’ll have plenty of opportunities to sample authentic Japanese cuisine, and the country’s many delicious spirits. We’d love to hear about your experiences, whether you’ve enjoyed an exquisite Japanese single malt whisky, or a taste of traditional sake. We also have tours to China, Southeast Asia, India and South America. Japan adventure, culture, food and drink, history. permalink.